Strengthening peace and building trust among different groups in society are key priorities once a conﬂict ends. Restoring investor conﬁdence, as well as strengthening political stability and inclusiveness, should be important areas of focus to help prevent future negative cycles of conﬂict resurgence and economic shocks. These policy challenges are described below. Conﬂict can increase risk perception of investors by increasing expectations about the potential for future outbreaks and instability. 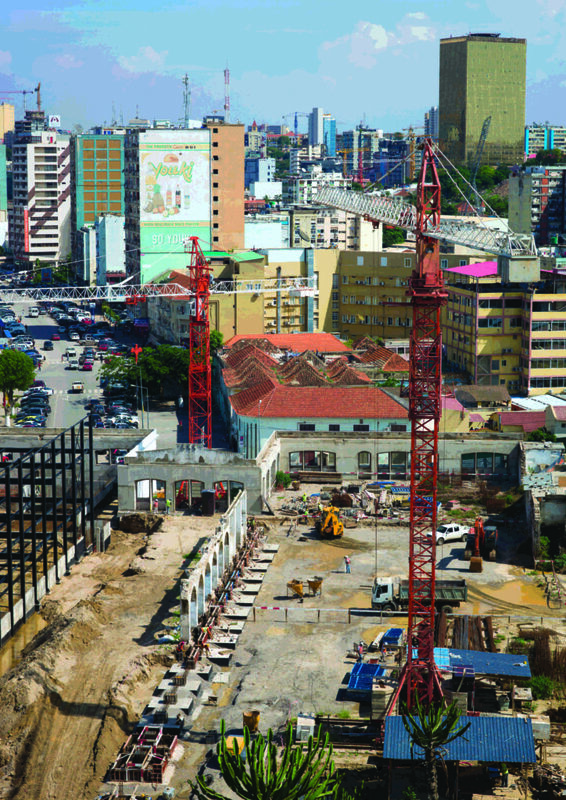 Political risk is transmitted to foreign investors in conﬂict-affected countries through three main channels: destruction of assets from the conﬂict; unavailability of inputs and adequate human resources; and sharp declines in domestic demand that lead to lasting impoverishment (Mueller et al., 2016). A number of studies have tried to quantify the effects of conﬂict on investment-related indicators, including stock market evaluations and housing prices. Overall, this research shows that the political risk of a resurgence of violence can directly inﬂuence expectations, asset prices, and investment, emphasising the economic importance of sustained peace. Evidence suggests that much of the economic impact of violent conﬂict comes from changes in expectations about future violence. 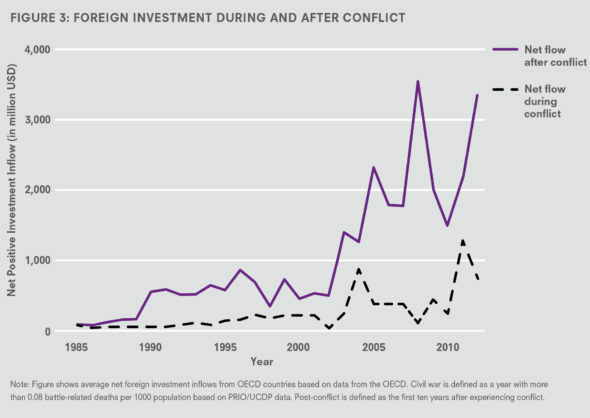 Figure 3 shows that foreign investment inﬂows to countries during conﬂict (black line) are much lower than in post-conﬂict countries (purple line). Enterprise surveys show that both multinational and local ﬁrms react strongly to political instability. Micro-level evidence here includes a study showing that a shift from violence to peace in Belfast, Northern Ireland, after the 1993 Downing Street Declaration, led to a 6–16% increase in housing prices (Besley and Mueller, 2012). Another empirical study explores how conﬂict affects stock market evaluations (Zussman et al., 2006). Using data on Israeli-Palestinian conﬂict since the late 1980s, the researchers found that major escalations in violence led to signiﬁcant declines in asset prices in both Israel and the Palestinian Authority (PA). Similarly, rocket attacks by Hezbollah during the 2006 Second Lebanon War led to a 6–7% decline in house prices and rents in the most severely hit localities – and these effects persisted until 2012 (Elster, Zussman and Zussman 2016). Policies to de-escalate conﬂict and commit warring parties to stable peace once the ﬁghting ends can thus help to attract investments needed to rebuild the economy. Countries should be poised to take advantage of the potential opportunity for large increases in foreign investment when there is a credible end to civil war. On average, investment inﬂows increase by 50% – amounting to 2–4 billion USD annually – when the violence stops (Mueller et al., 2016). Conﬂict often has lasting effects on the political environment and social trust in a society. Inequality between groups along ethnic or other lines is a major potential source of conﬂict. Political exclusion can perpetuate the unequal distribution of economic resources, which may further fuel instability and conﬂict. Inclusive political institutions and constraints on executive power can help to break the links between ethnic diversity, inequality, and conﬂict (Burgess et al., 2015; Besley and Persson, 2011; Mueller and Tapsoba, 2016). These institutions can help prevent conﬂict because they prevent ‘winner takes all’ dynamics where a loss of political power leads to economic decline. Conversely, there is strong evidence of a link between conﬂict and weak political institutions. Chen et al, (2008) ﬁnd that, compared to similar countries, conﬂict-affected states are slower to develop their political systems. Countries with a history of internal conﬂict manage to collect a much smaller share of taxes relative to GDP. One study suggests a tax take that is 7% lower than countries without conﬂict (Besley and Persson, 2008). A related body of research focuses on societal trust and ethnic tensions. A study on civil conﬂict in Uganda in 2002–2004, for instance, suggests that intense conﬂict can disrupt trade and lead to a breakdown of inter-ethnic trust, particularly in areas with high ethnic fragmentation (Rohner et al., 2013). Using satellite night-time light data as a proxy for economic activity, this research ﬁnds that ﬁghting in these areas is associated with a large and signiﬁcant fall in living conditions. An analysis of road-building in Kenya across ﬁve decades ﬁnds that democratic institutions can help to decrease ethnic favouritism in the provision of public goods (Burgess et al., 2015). Other research points to the importance of post-conﬂict justice institutions, such as the post-conﬂict trials in Rwanda, in helping to build inter-ethnic trust and also attract FDI (Bert and Marijke, 2015; Appel and Loyle, 2012). et al., 2014). Finally, there is some evidence from Liberia on the effectiveness of community-driven reconstruction efforts and work training programs for ex-soldiers (Fearon et al., 2009; Blattman and Annan, 2015). In summary, enhancing the stability and inclusiveness of political institutions is important to help build trust, mitigate the economic costs of conﬂict, and support lasting peace.